Brian is an Oregonian, hailing from Klamath Falls, Oregon. 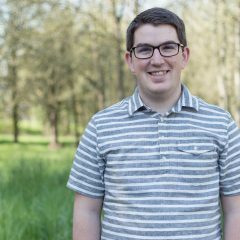 He joined our staff team and moved to the Newberg area in December 2014. He holds a B.S. in Educational Ministries from Multnomah Bible College in Portland. Before coming to Grace he had the experience of living a year in Hungary as a missionary and coached baseball while there. He and his wife Aubrey reside in Newberg.